For other uses, see Handan (disambiguation). Handan is a prefecture-level city located in the southwest of Hebei province, China. The southernmost prefecture-level city of the province, it borders Xingtai on the north, and the provinces of Shanxi on the west, Henan on the south and Shandong on the east. At the 2010 census, its population was 9,174,683 inhabitants whom 2,845,790 lived in the built-up (or metro) area made of 3 urban districts, Handan and Yangyan counties, and Shahe City in Xintai municipality, largely being conurbated now. Handan, once well-defended from southern attack by a bend in the Zhang River, was a city of the state of Zhao during the Warring States Period (5th–3rd centuries BCE) of Chinese history. It was their second capital, after Zhongmu. It has held the name "Handan" since at least the 1st millennium BCE. [clarification needed] King Wuling of Zhao turned Zhao into one of the Qin state's most stalwart foes, pioneering the use of walls to secure new frontiers (which would inspire the eventual construction of the Great Wall of China). The city was conquered by the State of Qin after the virtual annexation of Zhao by Qin except for the Dai Commandery. The first emperor of China, Qin Shi Huang was born in Handan, the child of a statesman from the state of Qin and after successfully conquering Zhao he ordered all enemies of his mother to be buried alive. The conquest of Zhao, particularly the Qin siege of Handan, is featured extensively in Chen Kaige's classic film, The Emperor and the Assassin. At the beginning of the Han dynasty, Handan was Liu Bang's base for suppressing Chen Xi's rebellion in 197 and 196 BCE. The town was still regarded as a cultural and commercial centre at the end of the dynasty in the early 3rd century CE. It slowly declined, perhaps because of the numerous battles that ravaged northern China following the Han Dynasty, but maintained a reputation for its fine Cizhou ware well into the Qing dynasty (1644–1911). It was also the birthplace in the 19th century of Yang-style tai chi, one of its five major schools. Though much of Handan's ancient history is no longer visible, it still has some attractions, most derived from Zhao folklore such as the road into which Lin Xiangru, courier of the precious Mr. He's jade, backed in order to let his nemesis Lian Po pass first, as well as the location in which Lian Po begged for Lin Xiangru's forgiveness. Modern-day Congtai Park is located on the site of the historical Zhao court. Next to Congtai Park is the legendary "Xuebu Qiao" (学步桥), or "Learning to Walk Bridge". Legend has it that a noble from the state of Yan heard of a particularly elegant manner of walking unique to Handan. Arriving in Handan, he spent weeks trying to master the Handan style of walking on a bridge, only to fail. In the process, however, he had forgotten how to walk normally and had to crawl back to Yan. This story inspired the Chinese expression, 邯郸学步, which means learning something difficult too intensely, thereby forgetting the basics in the process. The population at the 2010 census was 941,427 for the 3 urban districts, 2,845,790 for the built up area and 9,174,683 for the entire Prefecture-level city area of 12,068 km2 (4,659 sq mi). The municipal executive, legislative and judiciary are situated in Congtai District (丛台区, Cóngtái Qū), as well as the CPC and Public Security bureaux. Handan has a cold, continental semi-arid climate (Köppen BSk), with strong monsoonal influence, typical of the North China Plain. The normal monthly daily mean temperature ranges from −0.9 °C (30.4 °F) in January to 27.3 °C (81.1 °F) in July, while the annual mean temperature is 14.3 °C (57.7 °F). A majority of the normal annual precipitation of 502 mm (19.8 in) occurs in July and August. Handan has witnessed rapid growth over the past 20 years. Industrial growth in the city has focused on communication and transport activities. Handan is a major producer of coal and steel, with Coal mines at Fengfeng providing power for Handan's iron, steel and textile mills. Chemical and cement plants along with other industries also benefit. Local agriculture produces maize, pomegranates and eggs. Handan also has a growing services sector, with retail, banking and trading making up 40% of the economy. The GDP per capita in Renminbi was estimated at ¥13,449 in 2005. In 2015, the figure was ￥33,554.87. According to a survey by "Global voices China" in February 2013, Handan was one of China's most polluted cities due to heavy industrial outputs. However the government has made a significant effort to make the city cleanerwhich involved closing down many polluting power plants. It is no longer the most polluted city, and according to a 2016 government survey, the number of good air quality days is 189 days, an increase of 135 days compared with 2013. Handan Prefecture is home to the AAAAA tourist attractions Guangfu Ancient City and the Nüwa Imperial Palace. According to Handan government in 2007, 40 ethnic groups were present in Handan. Ethnic minorities represent 50,000 people, among which 48,000 Hui. There are 22 Hui schools and 5 Hui junior high schools in Handan. The most widespread religion in Handan is Chinese folk religion, including Taoism and Buddhism. In 2013, there were more than 150,000 Catholics in Handan according to the Catholic Church, in the Roman Catholic Diocese of Yongnian. Mother of Grace Cathedral in Daming County was built in 1918. The most recent church was built in 2007. There are also 300,000 Protestants. The largest Protestant church is on Qianjin Avenue (邯郸市西堂) and was built in 1997. The oldest church was on Congtai Street and was built in 1920. The church was destroyed 2009 by the local government. A new church was built in 2011. According to the local government 30,000 Hui Muslims live in the prefecture of Handan. ^ 河北11市最新人口排名出炉 唐山排第四 - 政策 -唐山乐居网. ts.leju.com. Retrieved 22 July 2018. ^ 中国地面国际交换站气候标准值月值数据集（1981－2010年） (in Chinese). China Meteorological Administration. Retrieved January 1, 2011. ^ Patton, Dominique. "China's chickens need to lay a billion eggs a day. Here's how..." U.K. Retrieved 2018-08-30. 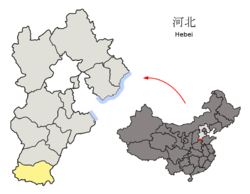 ^ "Handan (Hebei) City Information | HKTDC". china-trade-research.hktdc.com. Retrieved 2018-08-30. ^ Bildner, Eli (February 27, 2013). "Interactive Maps of China's Most–and Least–Polluted Places". Global Voices China. http://newsmotion.org. Archived from the original on 3 September 2014. Retrieved 1 September 2014. ^ Xu, Hui (徐辉). 【治霾·京津冀在行动】邯郸六大战役推动大气污染深度治理. CCTV-NEWS (in Chinese). ^ Fides, Agenzia. "亚洲/中国 - 河北邯郸（永年）教区六位执事晋铎 - Agenzia Fides". www.fides.org. Retrieved 22 July 2018. ^ 河北省民族宗教事务厅. "基督教". www.hebmzt.gov.cn. Retrieved 22 July 2018. ^ "杜树杰同志在全区三年大变样"百日攻坚大会战"动员大会上的讲话". Archived from the original on 3 September 2014. Retrieved 22 July 2018. ^ "邯郸市基督教北关教堂简史_河北省-邯郸市-基督教会-北堂 -邯郸基督教北堂". www.hdjdjh.com. Retrieved 22 July 2018. ^ Города-побратимы. Нижний Тагил. Администрация Нижнего Тагила. ^ Перелік державних та муніципальних сайтів. Kryvyi Rih City. Archived from the original on 2014-11-29. Wikivoyage has a travel guide for Handan.